I think this table is accurate, but please let me know if you spot any errors. This solution is in dominoes and required a collection of pieces of software I wrote in the course of answering Martin Büttner's two Domino related questions to produce (Golfing for Domino Day and Domino Circuits). I added a 7-segment display to the end of the circuit and fed it into a domino simulator/gif generator. The resulting gif (which shows 'A' being displayed) took about 2 hours to generate. Because the final circuit is 1141 * 517 in size each "cell" is represented by a single pixel. A black cell is empty, a grey cell has a standing domino in it, and a white cell has a fallen domino in it. This means that you can't really tell what is going on, and it won't help if it's being squashed at all. Sparr kindly provided a much smaller version of my original gif (650kB), so here it is! Below is the last frame of the animation for input 1010 ('A') as above. You can see the inputs on the far left, powerline at the top, the switchboard taking up most of the space, the 7 individual pieces of logic (these are domino representations of the functions above) to the left of the switch board, and to the far right is the 7-segment display itself. When this runs, the individual segments light up roughly at the same time, so you can't be looking at it for too long with some segments lit up waiting for others to light up. I am quite sure there are no simpler solutions to this problem, except perhaps by changing the symbols on the display, but that would be another and different problem. Since this is actually something useful to do, for instance when programming an FPGA to show output, I provide Verilog code. As for the minimalism: Of course it was tricky to make. It is not comprehensible, since a 7-segment display is just a fairly random way that humans show numbers, resulting in a circuit that is fairly random too. And as is typical for these minimal circuits, its logical depth is somewhat higher than for close solutions. I guess this is because serial is simpler than parallel. // but that would be another and different problem. // programming an FPGA to show output, I provide this Verilog code. // As for the minimalism: Of course it was tricky to make. // in a circuit that is fairly random too. // serial is simpler than parallel. // one bit per LED in the segment. 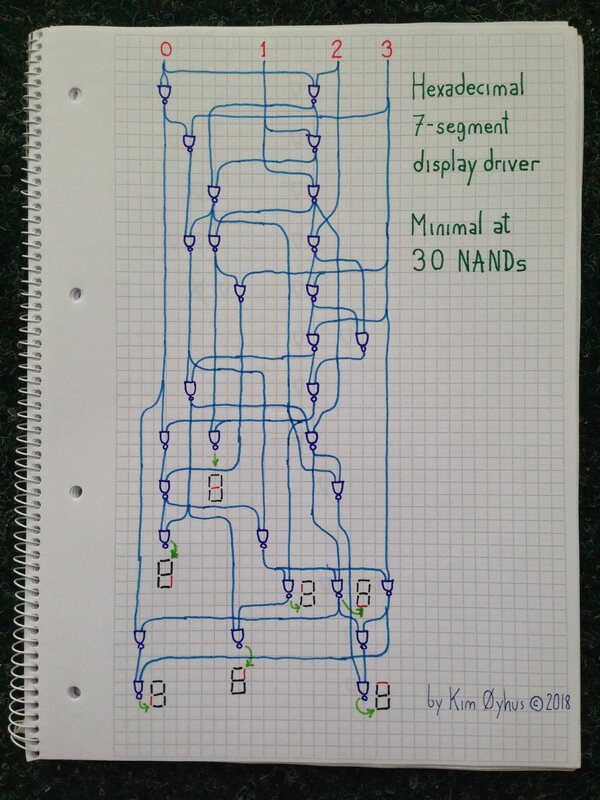 Using ~ for NOT and N for NAND, a computer search (without sharing terms between outputs) finds a solution with 82 NANDs without sharing. Manually looking for sharing terms reduces it to 54 NANDs, and a computer search that includes sharing further reduces it to 37 NANDs. The minimum might be even lower, as the method is certainly not exhaustive. Here's the program that recreates the above table. Each line is labeled with the NANDS for that output. Since this is my first logic gates challenge. 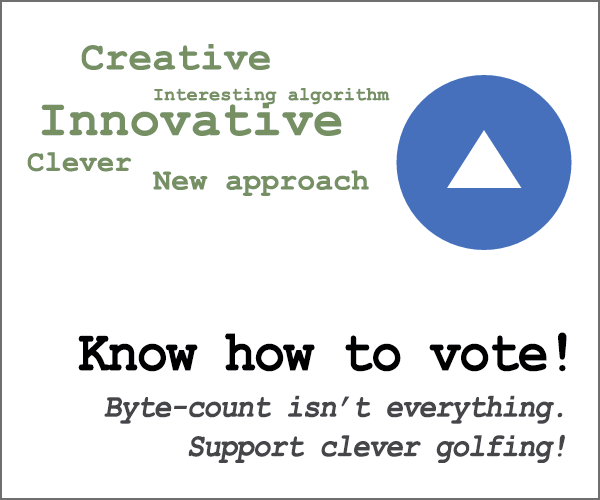 it is not golfed much, and may not be the smallest solution. I'm not using circuit split here. If I'm right, my score is 197. Copy and modify gate, and paste it to your browser's console, or Node.js REPL. Not the answer you're looking for? Browse other questions tagged atomic-code-golf logic-gates or ask your own question. 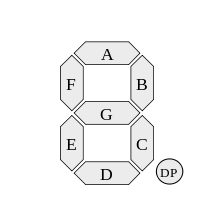 What is the simplest reversible circuit that computes conjugacy of transpositions?